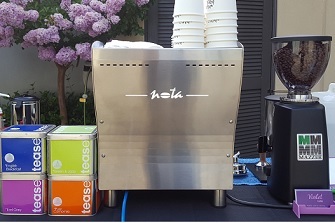 Serve barista coffees at your special event! Violet Cafe has a range of coffee carts, coffee trailer & coffee machines to suit indoor and outdoor events. We serve specialty coffees and other delicious hot drinks with our experienced, friendly and professional barista. Booking with us is easy. Let us know your event details and we will create a package that suits your event. Our clients have always compliment us on how easy and hassle-free to book our mobile coffee catering service. We cater from small events to large events, from a few hours service to multiple days coffee service. With our industry experience and attention to detail, you can be sure we make great coffees to keep your event guests impressed and well catered for, so you can relax and enjoy your event. We provide all inclusive coffee service with barista hire. Hiring our mobile coffee service include barista, supplies and coffee cart / coffee trailer / coffee machine. 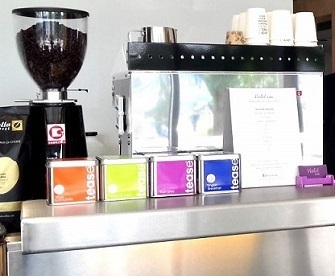 Our menu on your event day includes coffees, hot chocolates, mochas, chai lattes and a variety of quality teas. Violet Cafe will travel to events in Melbourne, Geelong, Bendigo, Ballarat, Phillip Island, Mornington Peninsula and other regional Victoria. We cater for corporate functions, exhibitions, conferences, weddings, school events and private parties. We have mobile coffee set ups to suit indoor and outdoor events. We can also bring our own power (generator) and marquee. For coffee cart hire, we usually use our standard coffee cart (2-group coffee machine). 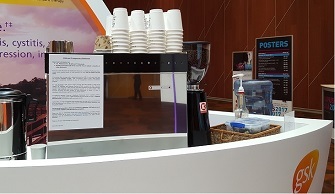 Small coffee cart (single group coffee machine) is used for events with restricted access to the venue (i.e. steep slope, small venue space), residential venue and venues with parking restrictions. We will assist you in choosing the right coffee set up for your event. For coffee machine hire without a cart, we need custom built coffee bench at your trade show, exhibition or conference. We will assist you in having the right dimensions and power requirements for the bench with your stand designers / builders. If your stand does not have a customised bench, we can bring our coffee cart instead. We have catered for conferences, exhibitions and trade shows. Having a coffee service at your stand brings the crowd to you, as attendees usually stays to chat while enjoying their coffee, teas and other beverages we provide. This is the reason why more events require barista coffee catering at their events. We also have a coffee trailer for outdoor events and food trucks events. If you are after a coffee van, coffee trailer hire is a great choice as it can cater from small to large events. 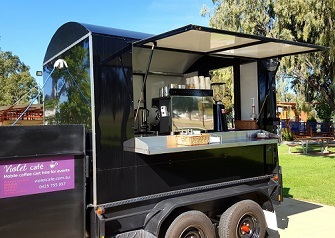 This charming black coffee trailer would suit any outdoor events, from corporate functions to weddings. All events are different. We provide a customised package to suit your event. We recommend booking us early to ensure we are available for your event. Submit your event details to get a quote. Check out our photo gallery of our mobile coffee catering at events in Melbourne & regional Victoria. Find out what our customers say about having us at their event! Testimonials from some of our customers. Check our frequently asked questions on hiring our barista coffee service for events. For coffee cart hire and coffee trailer hire, set up area needs to be on flat / level and stable ground. For coffee machine hire at trade shows / exhibitions, bench area needs to be confirmed with us to ensure the equipment can fit properly. Access from unloading to set up area must be flat / ramp / lift access. If there is only one or two steps, we may be able to cater with our small coffee cart using our portable ramp. Our coffee carts generally fits into all lifts. However, it is good to check our cart length measurement with your lift. The standard coffee cart is 1.2 metres in length. For standard coffee cart hire, we need 2 parking spaces with height clearance of 2.4 m. For small coffee cart hire or coffee trailer hire, we only need 1 parking space for our towing vehicle. Check out our sweet catering to see the food options we can provide to compliment our coffee service at your event. We have catering choices to suit morning to evening events. Note: Bookings located more than 20 km outside Melbourne CBD may incur a travel levy to cover barista extra travel time and fuel costs. Our quotes do not include additional fees that your venue may charge for an external catering supplier. Please contact your venue to enquire on any additional fees. An invoice with a final quote will be emailed for your approval after specific details of your event are discussed. Emailed quotes are valid for 30 days. Full payment is required to secure event date and time. Cancellations (for prepaid / standard hire service) made more than 2 weeks prior to event date will be refunded 50% of total invoice (excluding any PayPal / credit card transaction fees). No refund is given if the cancellation is made within 2 weeks prior to event date. No refund is given for retail service cancellation. All cancellations must be via email. Payment can be made by bank account deposit or credit card (approx. 3% fee applies). If there is any agressive or hostile attitude towards our barista and the event contact person cannot resolve this, we have the right to stop service immediately with no refund given. In extremely rare situations where the serviced equipment breaks down, we will quickly fix the equipment or give a full refund and try our best to find an alternate supplier for your event.